Hello my lovely blog buddies! How was you Easter break? Mine was filled with sunshine, good company and lots and lots of chocolate of course! The last of the sugary bunny was devoured yesterday and now I'm back to savouring little squares of delicious darkness and walking a little further than usual to combat said sugaryness! My Rag Doll is the second book by author Corinne Crasbercu and is currently a #1 bestseller in Amazon UK's soft toy section even though the official release date isn't until next month, May 14th! And there's a mighty fine reason why this book is already doing so well - it is absolutely beautiful! Although I haven't got my hands on an actual copy yet the ebook has me completely smitten. I know. I know. Ebooks aren't my favourite but I'm thinking of it as a preview to the actual copy I can hold in my own two hands. And when the preview is this good you can't help but fall in love with it! 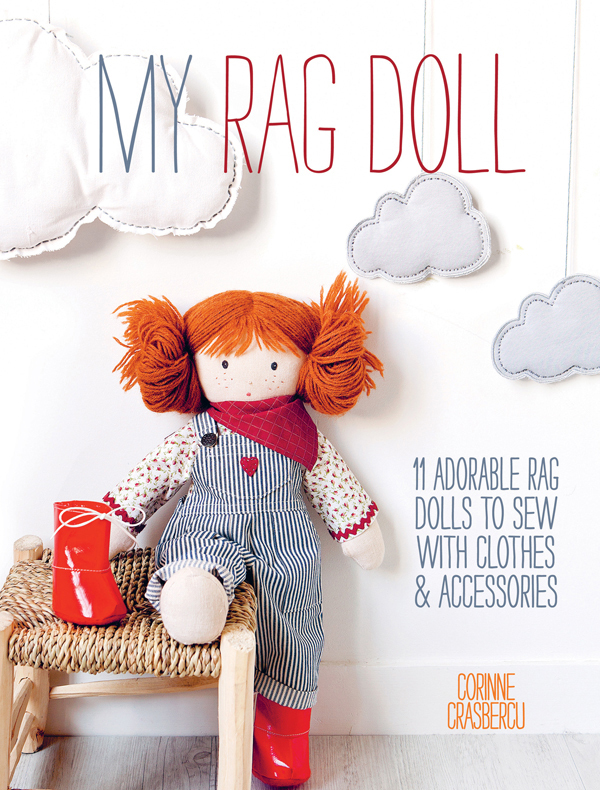 My Rag Doll is a beautifully presented craft book celebrating Corinne's childhood passion of creating her own dolls and stitching entire wardrobes for them, something that inspired her career in dressmaking for film and TV. Although the idea isn't new Corinne takes the basic rag doll concept and updates it so beautifully in this book. 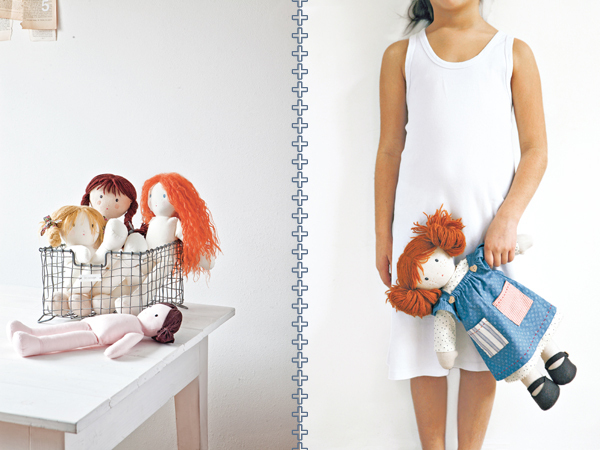 It is divided into three main sections - the first guides you through creating the basic rag doll, with six different ideas for hair colours and faces, the second consists of thirteen different outfits with full written instructions and all the templates you will need can be found in the last section. The presentation throughout it's pages is fresh, light and airy and the doll designs are pretty but not too girly - alongside the bride and ballerina is the doll in dungarees (pictured on the cover) and the doll in a raincoat. The beautiful photography, styling and page layout match this not to girly approach and are what grabbed my attention most of all. It is simple and unfussy with great attention to detail, I mean how gorgeous is that tall skinny font!? I love it! 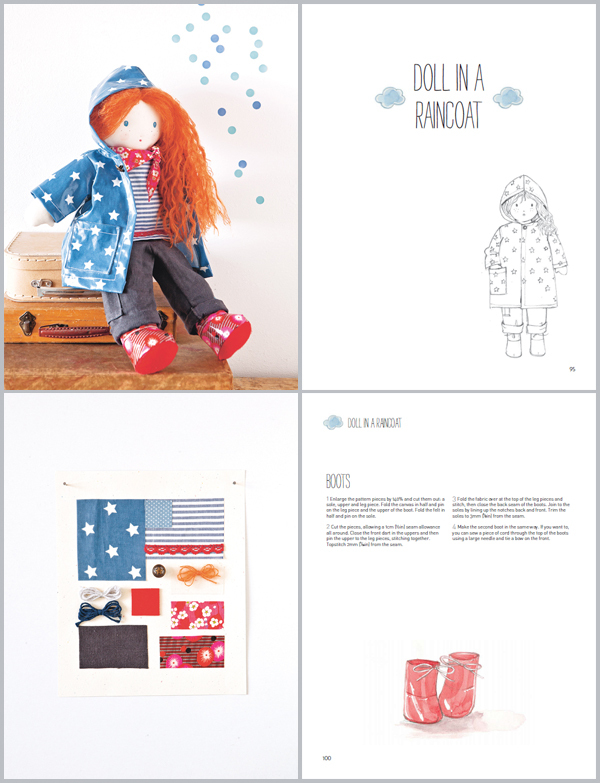 Below is a peek of a few pages from one of my favourite doll designs, the doll in a raincoat. Each design includes a title page with hand drawn pencil sketch and cute illustrations (see those tiny clouds below!) as well as a mood board of materials - I totally swooned over that one too! And the colours? Well all that white space totally gets my vote and while there is a lot of pink in there it is perfectly balanced with denim blues, orange and red. 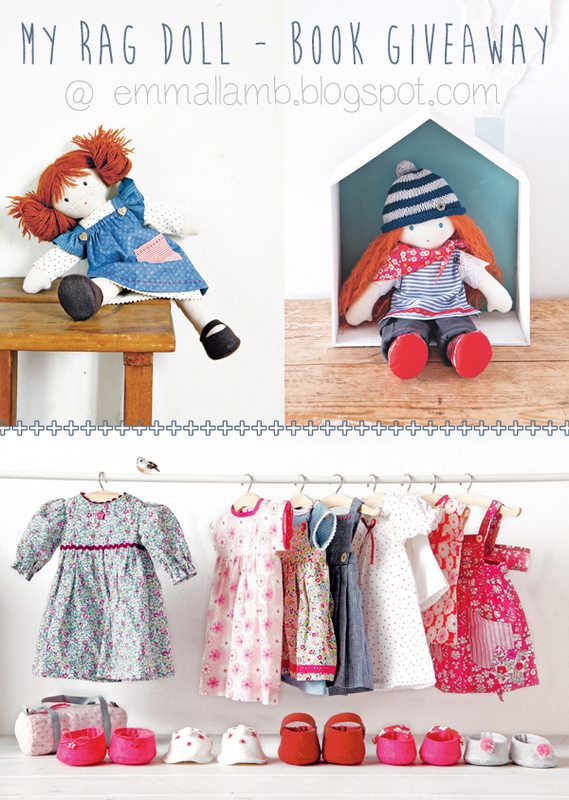 Corinne's fabric choices throughout the doll designs are spot on too - stars and stripes with tiny florals and a sprinkling of Liberty loveliness. All in all an absolutely perfect combination making a very beautiful book. This is exactly the kind of book I wish I had had when I was a wee girl. Although I wasn't a huge fan of dolls and never really played with them I did love to knit and crochet clothes for them and I think I would have loved this book and spent many happy hours stitching. And now as an adult I so can't wait to have an actual copy in my hands! Hopefully by now you are excited as I am about owning your own copy too? Well here's the really great bit - a giveaway! As part of this blog hop I have one copy of the book to give away to one of my very lucky readers, yay! This giveaway is open internationally and all you need to do to be in with a chance of winning is share the picture below then come back here and leave a wee note in the comments telling me about your favourite doll as a child. You'll also need to include a way for me to contact you, by email preferably but no Twitter handles since I'm not on there yet, and that's it! I shall close the giveaway on May 3rd 2014 and will announce a winner soon after. Good luck everyone! For more reviews and giveaways of this beautiful craft book check out the previous blog hop participants - Kestrel Makes, Dolls and Daydreams, Follow the White Bunny, Whipstitch, A Spoonful of Sugar, Feeling Stitchy, House of Pinheiro, A Stitching Odyssey, iCandy Handmade, Shimelle, Heather Bailey. My Rag Doll is available for pre-order at Stitch Craft Create here or through my Amazon book shop here. What a lovely book, I would love to make such a doll. How fun! I'd love to be able to make beautiful handmade dolls for all the kiddos in my life! I would love the chance to be in the drawing for this book! Je zal het maar winnen. My first doll was a "Tiny Tears". She 'wept' and 'pee-d' (by putting water inside the body - weird), but I loved her so much. Later on I really loved the soft toy animals my Granny made me from fabric and felt. I had a really great mouse doll with a lovely blue dress and matching hat. This looks a fabulous book - I don't have a blog etc so I can't share the photo but I hope I can still enter! My first doll had long braids of red wool. As a little girl I had a doll called Little Lucy and she was only little but I loved to knit and make clothes for her and because she was small it was quick to do and highly satisfying! P.S. Shared on my blog! Great book! and I'm glad to know that this give away is a international one! I am from Argentina and my favourite doll when I was a child was the Cabbage Patch Kids. I already shared your image on Pinterest and on my blog too with special motion on the sidebar! You are very welcome to see it! Thank you so much to let me participate!! Your blog is loooooovley!! Congrats! I shared via Pinterest! This book looks awesome!! I'd love to win it! My favourite doll was one that had a hard plastic head and plush body. Her eyes open and closed depending on angle of head. She doesn't have much stuffing left in her....just her hands and feet now. Now I'm going to have to find her lol. My favorite doll as a child was a Mickey Mouse doll, loved that baby!! I shared and my favorite doll as a child was a rag clown my great grandma had made for me. I still have it 56 years later. I have pinned the picture and have also shared it on Facebook. Nicola, the doll, was almost as tall as me and if you pressed down on her shoulders she "walked"!! In her back was a little compartment. In the compartment was a disc player. She came with a few little plastic discs. When you loaded in the disc and switched her on she talked!! This is a great giveaway. Thanks for the opportunity to have a copy of this book. and I hope it help to spread this good news! oops - forgot to leave the link to my pin in previous comment - sorry. My favourite dool as a child was a handmade tricot dool that my mother made. I hope to be the lucky one! My favourite doll when I was little was actually a bunny, I imaginatively called her Bunny, and she ended up in many different costumes, adventures and occasionally in wigs I made her from fabric! My favourite doll was a doll I named Toastbud and I still have her 50 years later!! I loved Raggedy Ann and Raggedy Andy to pieces! Still have both of my dolls, so that makes them almost 50! They look a bit worn, but very loved! I also had a monkey named Zip, which I also still have. He has been through a lot of love and dragging around, but he is still able to sit upright! I shared your wonderful contest on my Facebook. I hope you are having a lovely spring! Such a nice and pretty book! My favorite doll was a Bitty Baby doll from the American Girl company. My mom made me all the accessories to go with her - a diaper bag, diapers, wipes, extra clothes. I loved playing mommy! My favorite doll wore a red velvet dress with a matching hat and shoes and a little lace petticoat. I always wished I had a large version of her dress. Fortunately, that wish did not come true or I probably would have worn the dress daily. The first doll I fell in love was my mother and she loved her long blond hair comb. My favorite doll was one that my own mother made me. I named her Sylvia. I'd love to continue the tradition by making a doll for my daughter! Shared on Pinterest. My favourite doll is my first dolly, a hard rubbery doll with a squeaker! Orange pigtails and the biggest freckles you've ever seen, oh and the chewed fingers!....better than a dummy I guess! My mum thinks shes's the ugliest doll on the plant but I love her all the same. She's still with us at a ripe old age of 43! When I was very young I had a doll named Baby Beans that I carried everywhere with me. Here's a link to picture of one similar to the one I had: http://thumbs3.ebaystatic.com/d/l225/m/mnCjyWNX3MV-w975fJ1D07g.jpg After carrying her around so much she began to fall apart, so my great-granny made a new outfit for her out of a red, floral corduroy fabric. Thank you for the chance to win such a wonderful book that stirs such fun memories! (I've shared on Pinterest, you can reach me at shortyssutures @ gmail dot com or through my blog. Thanks again! I had a two dolls when I was growing up, one was a Porcelain doll that was very special and I still have her tucked away waiting for my daughter to get old enough to play with her. And the other one was a knitted doll that I took to bed every night. She had a knitted outfit in green (my favourite colour) and I loved her. She now sleeps on my daughters bed. I love that she is now being loved again. I didn't have many dolls as a child but I did have one which was a rag doll made by my mum. She was called Rosie and had freckled cheeks and red plaited hair.